Machine equip with a large 32" LCD screen for the players to interact with the fighting technology game, the screen supports CRT, VGA, HDMI, DVI multiple connectors. The control panel design for single player, and mount the joysticks and buttons of SANWA brand, strong and durable, long service life. 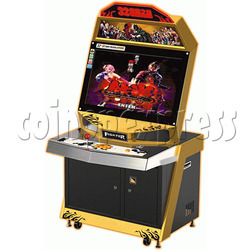 Machine can online battle play the game, and the cabinet with black-white color and black-champagne color for option.